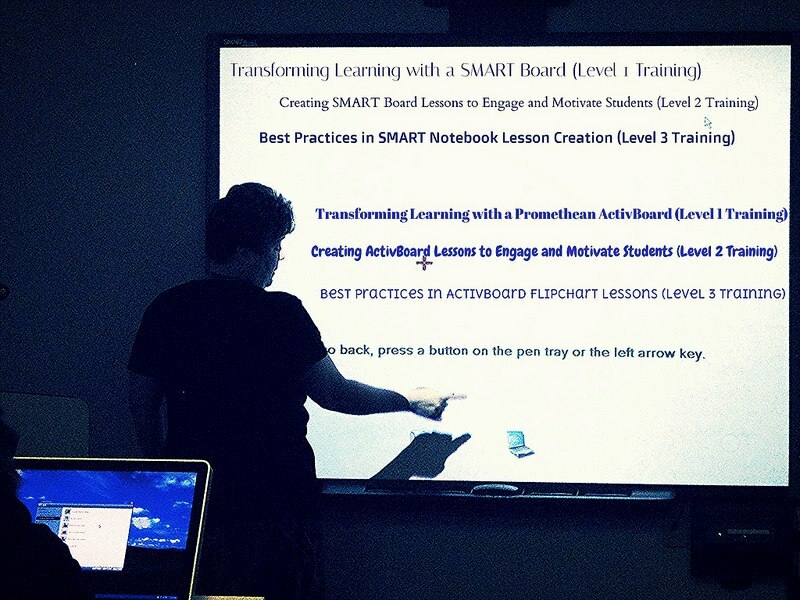 Here’s a snapshot of today’s SMARTBoard Level 1 workshop taking place in Cooperating School Districts‘ tele. See more photos from today, and other professional development sessions, on Flickr. The VLC ITT team has been meeting to discuss the new tele courses we will offer this summer, then again in the fall and spring. What we do know is that we will offer both MAC & PC platforms in the MS Office Suite. With our new MAC computers with dual processors and Parallels installed, it is easy to flip from PC to MAC in a few seconds…so cool! We also know we will offer both SMART Board and Promethean Activboard training. Many are requesting advanced unitedstreaming, more Web 2.0 courses with blogging, podcasting, and social networking. Internet Safety/Netiquette courses are a growing request as well. The final course offerings will be posted in April, so make sure to check back. In the meantime if you are interested in other courses, let us know. Keep in mind that most of our technology classes offer University credit through Lindenwood University. Also we can offer any of our classes as on-site PD or through videoconferencing too! The February ACT prep videoconference class has a registration deadline of FRIDAY, DECEMBER 14th. Don’t forget to sign your students up for this great interactive videoconference course. Three practice tests are included in the price. The Princeton Review instructor utilizes the SMARTBoard, allowing the students to see the math equations and word problems the group is working on. Contact me at rmorrison@csd.org if you have questions! METC Super Early Bird Registration Extended!! I’m pleased to let you know the Super Early Bird registration for the Midwest Education Technology Conference has been extended to December 15th! This is the 25th anniversary of the METC, and it has grown so much we needed a new venue to hold this great education & technology conference. In February, you can attend the METC at the St. Charles Convention Center, just west of St. Louis, over the Missouri River. METC speakers include Rem Jackson, David Warlick, Larry M. Buchanan,Mike Butler, Steve Dembo, and Gail Lovely. Strands include, but are not limited to, Library Technology Integration, Digital Media, Web 2.0, and Handheld Computers.For more information on METC, visit www.csd.org.